This is a direct replacement canister for the Grizzly G0548/Z & G0562/Z Dust Collectors. 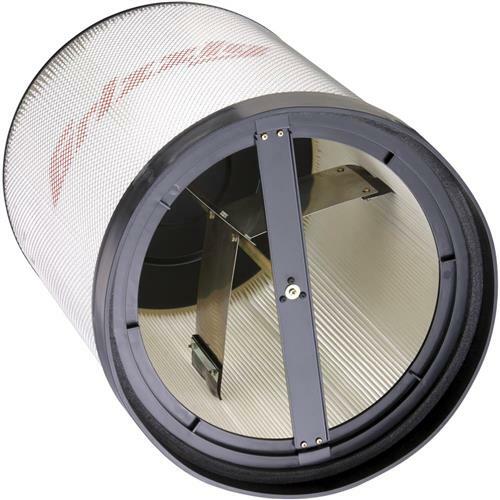 Filter is spun bond polyester and allows filtering to 1 micron with minimal loss of dust collector performance. Features a built-in filter cleaning mechanism. I have a 20 year-old G1029 vacuum with a bag. I wanted a canister to increase airflow and dust particle collection. I was concerned that this canister would not fit, so I very carefully unpacked it all expecting to have to return it. To my surprise it fit perfectly, I mean perfectly. Just slipped on. No adjustments required anywhere. It took longer to get the bag off than slip the canister on. Super happy. Fits well and easy to clean I replaced the bag on my Harbor Freight DC with this and it works great. I replaced my bag filter with this canister, and I get a noticible increase in draft/suction at each tool. Wished I'd changed earlier. I have been using 1 Micron bags for many years and they always got clogged after a lot of use and the suction power drops drastically. I finally decided to buy the canister style and the suction power has doubled or even tripled. Best decision I have ever made in my dust collection. I turn the flappers inside the canister every week or so. I am glad to see the bag gone.I highly recommend this product. I give it 5 stars. After the bag on my 15 year old G1029 slipped off and filled my shop with a dust cloud, I realized the bag had gotten loose with age. Rather than a replacement bag with a 2.5 micron capacity I decided on the canister with a 1 micron capacity and never a chance for another blow out. It works really great. Grizzly does need to update their description to show all the collectors it fits. I almost passed it up because it only listed two collectors but I called tech services and they compared measurements and told me it would fit. Also include in the description that the required narrow and wide foam seals are included. This has been a great addition to my 2hp dust collector. A very nice snug fit. There is definitely more suction because of this enormous filter. A very well made filter, and the "flapper" is a big plus. Bought this late November to retro-fit my HF dust collector and pleased with the results. Simple process includes all means to secure filter to bag type filter and in less than 30 minutes improved my vacuum and filtration. Great addition to my existing system.